This is official weblog of the Kakegawa Kachoen, introducing you the garden's daily scenes and topics with original pictures. Today, December 27th, we show you new models of vinyl folders that the Garden and affiliated gardens will put on sale from the New Year's Day. 12월27일 오늘은 원단부터 화조원의 매점에서 판매되는 새로운 파일폴더를 소개드리겠습니다. Currently the Garden sells three kinds of vinyl folders, Popo the White-Faced Scops Owl, Coco the White-Faced Scops Owl, and Macaws. Sinc they are quite popular items in the shop, so we decided to produce more models for sale this time. 전에부터 판매되고 있던 폴더그림으로는 부엉이 뽀뽀쨩과 코코쨩,쇠검은머리금강앵무와 오늘 소개드리는 새가지 종류가 있습니다.매점에서도 호평을 많이 받아서 종류를 증가하게 된 것입니다. 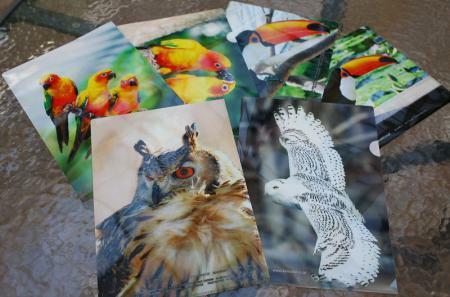 The Garden asked some shop staff members to choose popular shots in postcards and memo pads that the Garden sells, and these shots were adopted to new models of folders. 이번에는 화조원의 매점의 스탭분들도 기획에 참가해서 매점에서 팔고있는 그림엽서나 매모장에서 잘 나가는 사진을 골라서 폴더의 그림에 올리기로 했습니다. The top picture shows a folder of Sun Conures. 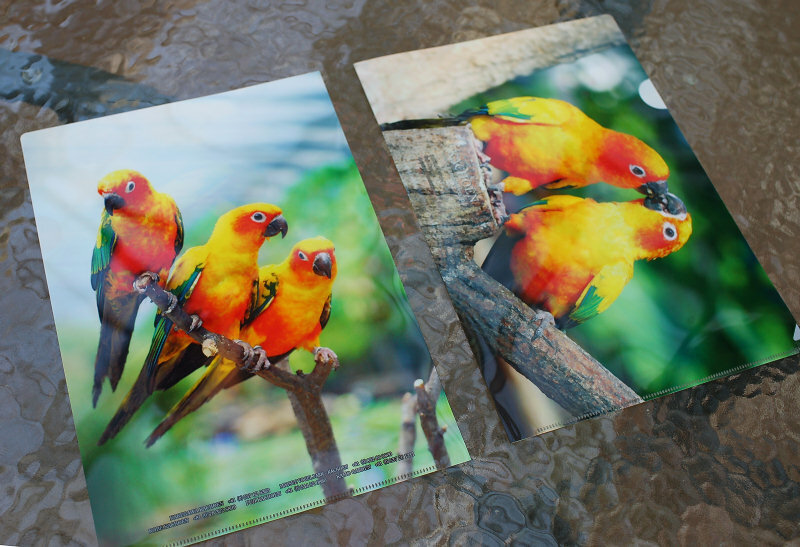 It has cute Sun Conures on both sides, a must for all who love the conures. 첫번째사진은 태양황금앵무폴더입니다.뒷면에도 귀여운 태양황금앵무그림이 찍혀 있어서 보기만 해도 갖고 싶어지게 됩니다. 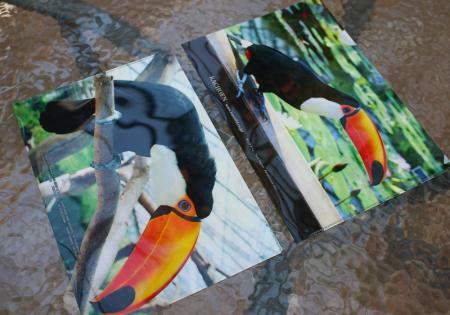 Second, a folder of Toco Toucans. We have chosen an impressive bird that is also seen in affiliated gardens, and that fell into this. 두번째는 토코투칸그림입니다.될수록 카케가와화조원외의 다른 원에도 있고 눈에 잘 띄는 새를 골리기로 했습니다. The model is Mark, the one that is on the cover of the pamphlet of Kobe Kachoen. 토코투칸사진은 고베화조원의 카달록표지에도 올랐던 사진입니다. Third is a folder of owls. 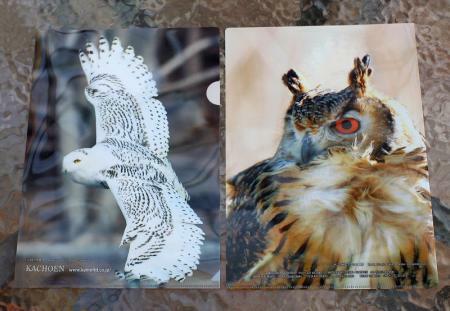 It has a picture of Harry the Snowy Owl on the top and a Rock Eagle Owl on the back. 세번째는 부엉이폴더입니다. 앞면은 흰올빼미 하리이고 뒷면은 벵갈수리부엉이입니다. Harry is a male and, now that it has grown after the picture was taken, its body is almost pure white with fewer black dots. 하리는 수컷의 흰올빼미인데 이 사진을 찍었을 때보다 훨씬 커버려서 몸에 까만점이 사라지고 새하얗게 변했습니다.하지만 다른 원에서 비행쇼를 하고 있는 암흰올빼미도 있어서 이 사진오로 해도 괜찮지 않을까…라는 생각으로 사용해 보았습니다.암흰올빼미는 성조가 되여서 몸에 까만 점이 남아 있습니다. Rock Eagle Owl is the most popular owl among visitors for its appearance on the flight show and handling service. This picture, taken at the outdoor flight show in mid winter, depicts the dignity of the owl well with its feathers fluttering in cold wind and sharp eyes. This picture makes you realise that cold season has a beauty of its own. 뒷면의 벵갈수리부엉이는 비행쇼와 손님과의 만남에도 등장하는 사람과 가장 친숙한 부엉이입니다.이 사진은 한겨울에 실외의 쇼중에 찍은 사진이라 찬바람이 부엉이의 깃털을 흐틀어 놓았습니다.덕분에 부엉이의 위엄당당한 모습이 더욱 강조되였습니다.이 사진을 보면 추운 계절도 추운만큼 좋은 면이 있구나 라는 생각이 듭니다. These folders are 300 yen each, available at the shop next to the entrance of Kakegawa Kachoen, and also at Kobe Kachoen, Matsue Vogelpark Kachoen and Fuji Kachoen. 이 폴더들은 하나에 300엔입니다.카케가와화조원 입구양쪽의 매점에서 팔고 있는 외에 고베,마쯔에,후지화조원에서도 판매되고 있습니다. Please take a chance to buy one during your visit to one of these gardens! 원단에 오실 때는 마음에 드는걸 골라가십시오.